Reinforced Kraft Paper (also known as poly-craft mask) from Koffler protects your valuable marble, hardwood, tile, and granite surfaces during construction to keep them damage and stain-free. Ordinary kraft paper or rosin paper will tear and let liquid spills through, but the poly coating on our reinforced kraft paper provides a moisture barrier while the filament fiber provides strength from tearing. Simple to use - just roll it out, trim to fit and tape the seams. If I order a1030..72x300 red reinforced rosin paper Monday morning, when would it ship? I need it by Thursday delivered to 76691. Is this possible with ground shipping? How breathable is this material? Will it trap in moisture as well? My company uses about 16 million square feet of floor covering per year, we are looking for a newer alternative then what we are currently using. Let me know, thanks! 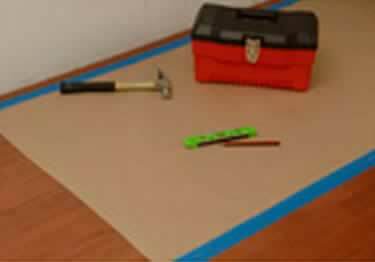 Reinforced Red Rosin Paper or Kraft Paper (also known as poly-craft mask) from Koffler protects your valuable marble, hardwood, tile, and granite surfaces during construction to keep them damage and stain-free. Ordinary kraft paper or rosin paper will tear and let liquid spills through, but the poly coating on our reinforced kraft paper provides a moisture barrier while the filament fiber provides strength from tearing. excellent for our new wood floor and movers. shoes cover was strong and big for till the end of work done. tape was perfect . We (construction company) normally purchase the red rosin paper, but we liked that this product was reinforced and came with a moisture barrier. We have wet winters and springs in the midwest so we are thinking that this will be excellent protection for our newly installed wood floors. We also like that the roll comes in 72" saving us time on installation.